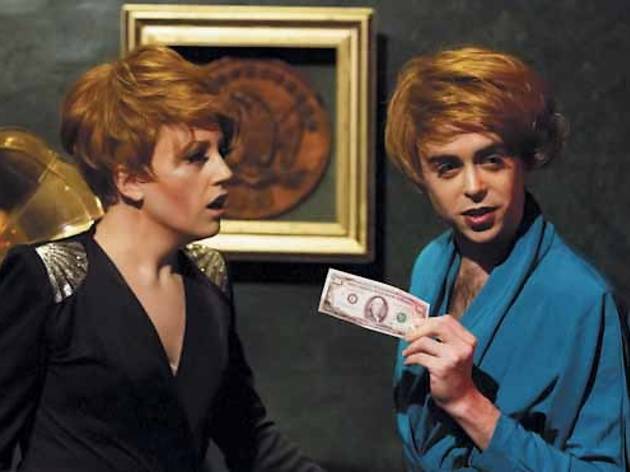 Dog & Pony’s vaudeville-style riff on fake money generates genuine laughs. Aaron Weissman’s brief new work examines the American dream via those who forge it. In vaudevillesque vignettes, we’re introduced to historical “counterfeiters” including Samuel Upham (Alex E. Hardaway), who sold fake Confederate bills from his Philadelphia stationery shop during the Civil War, and Benjamin Franklin (Scott Ray Merchant), who printed currency in the colonial era. Other characters are fictional, including an oily modern-day trader (Aaron Rustebakke), a 1920s flapper girl (Annie Prichard) and, most delightful, a pair of gender-bending 1980s artists (Caroline Kingsley and Kieran Kredell) whose work, as they describe it, is much like that of the real-life artist J.S.G. Boggs. Once introduced, these characters reappear—in scenes with touches of magic and music—from every angle: Directors Krissy Vanderwarker and Jenn BeVard place the audience at cabaret-style tables, with playing spaces all around. Weissman’s more highfalutin points don’t always go over. We all think the economy is other people’s fault, says a tap-dancing 1819 banker, but what if you took the blame on yourself? Mmmkay. 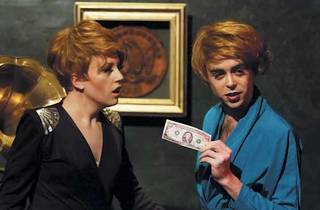 But with an agreeable cast (and a cash bar), Counterfeiters is a goofily entertaining examination of the price of le rêve américain.